Studies show that a diet high in antioxidants slows down the signs of aging. And, that’s not the only benefit of a diet high in antioxidants; it is also linked with lowering risks of cancer, heart disease and diabetes. There’s simply no reason to pop excess pills and vitamins in order to jump on the anti-aging band wagon. Nature provides all you need in fresh foods naturally and they don’t come in a bottle or a compressed into a pill. The very best anti-aging products are grown not produced; nature provides all we need by way of anti-aging foods she generously provides. It’s up to you to focus on choosing the right ones; your best chance for a long, vibrant, healthy future begins with produce. Just think plant foods. Some of the best anti-aging foods you can treat your body to are veggies. 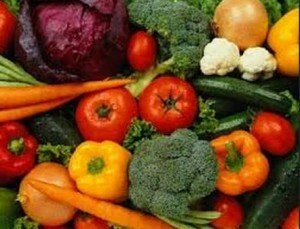 Typically its best to choose vegetables (and fruits) that are deep in color as they sport the highest antioxidants. Vegetables: Anti-oxidants are found in abundance in vegetables; they give your body the fighting fuel it needs to kill free radicals…those unstable compounds causing havoc and speed up the aging process in your body. Broccoli: Many people look to oranges or some sort of citrus for their Vitamin C, but broccoli is also high in vitamin C. This green veggie also contains coenzyme Q10…an antioxidant that fights free radicals. Q10 helps skin cells to withstand stress. A diet high in this coenzyme is able to repair skin damage at a rapid pace which in turn helps to slow the aging process. You can purchase this anti-oxidant in very high priced anti-wrinkle creams or you can supply your body with all it needs through the gifts of nature; broccoli. Kale: Another deep leafy green that is a major source of vitamin K which helps to ward off osteoporosis and heart disease. High in fiber, Kale can also help to lower blood pressure and cholesterol levels. Spinach: Another vitamin tapped by the anti-wrinkle movement is vitamin E. Spinach is high in vitamin E, another powerful anti-oxidant and when included regularly in your diet will promote younger and more vibrant skin. Eggplant: Nasunin is the nutrient that gives this vegetable its rich deep purple color. Nausunin helps fight cancer cells by cutting off the blood supply they need to multiply. This nutrient also works to slow the development of Alzheimer’s disease by preventing free radicals from damaging neurons. Red Bell Pepper: This immunity boosting super-star contains loads of vitamin C. There have been studies that found that people with diets high in vitamin C had less wrinkles most likely because this nutrient spurs the production of collagen. If you’ve been a green bell pepper fan all these years you might want to consider its counterpart since the red bell pepper has 60% more vitamin C.
Brussels Sprouts: The sulfur compounds found in Brussels sprouts help with your own tumor-suppressing genes that your cells are naturally equipped with. Studies indicate that these sulfur compounds could possibly play key roles in treating rheumatoid arthritis by reducing inflammation and activation cartilage-protecting proteins. There are many ways to add antioxidants to your diet. Nature has been generous in her gift of antioxidants; it’s up to us to take advantage of them. JustSayNoToCancer provides you much needed information on how to protect yourself against diseases such as cancer. Remember we’re talking about life …your life and the lives of your loved one is it worth the risk not to read and educate yourself on this issue?